Whether a farmer can afford a forge and anvil will depend upon the distance to a blacksmith shop, the amount of machinery repair work he needs to do or have done, and his ability as a mechanic. Although not every farmer can profitably own blacksmithing equipment, many farmers can. 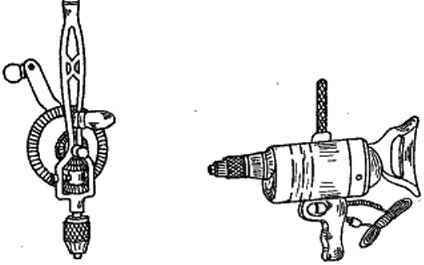 If a farmer cannot, he should remember that a great deal of repair work can be done with cold metal, if he has a few simple tools like a vise, a hack saw, files, cold chisels, and drill:. Although blacksmithing under many conditions should occupy a minor place in a farm shop course, no such course can be considered complete without at least some instruction in this work. Blacksmithing is generally more difficult than woodwork. Almost any high school boy with average mechanical ability, however, can soon learn to do simple blacksmithing and feel well repaid for his effort«, if he will set himself diligently to the task. In all mechanical work, much more rapid and satisfactory progress can be made if the student will carefully study the theory and principles along with his practice. This is particularly true of blacksmithing. 276. The Forge.—The forge for the farm shop should have a gear-driven blower operated by a crank, and it should have a hearth at least 18 in. wide, preferably somewhat larger. Probably the cheapest way of providing a good forge is to buy a good blower and tuyere (that part in the bottom of the hearth through which the blast comes) and make a hearth and stand of concrete, brick, or other masonry. The forge should be provided with a hood and pipe connection for taking away the smoke. 277. The Anvil.—Anvils are of two general grades: cast iron and steel. Steel anvils are much better and should be used if they can be afforded. The two kinds can be distinguished by striking with a hammer. A cast anvil has a dead sound while a steel one has a clear ring. Hardy hole suitable block or stand, will serve fairly well for light hammering and riveting, although a much greater variety of work can be done on a regular anvil. 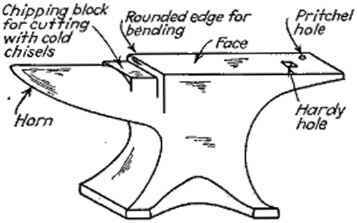 Use of Different Parts of Anvil.—The horn of the anvil is used for making bends and shaping curved pieces; and the flat, face is used for general hammering. The flat depressed surface near the horn is the chipping block, and here all cutting with cold chisels and similar tools should be done, rather than on the face of the anvil. The chipping block is soft and will not damage the chisel if it cuts through. 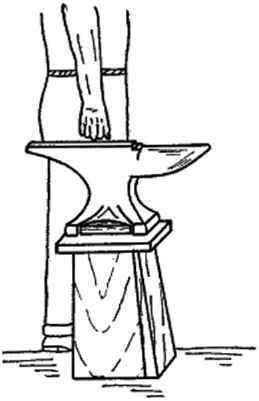 The face is hardened and cutting into it with a chisel would damage both the chisel and the face, which should be kept smooth for good blacksmithing. The better anvils have a corner of the lace next to the horn slightly rounded, so that sharp bends may be made in rods and bars -without unduty-marring or galling the iron. __anvil is used for punching holes. It is called the pritchei hole, taking its name hSLiattchl from the sharp punch used by smiths in height that the face of the anvil can punching nail holes in horseshoes. The just be readied with the knuckles of i i • ,» „ . i .v . the clenched fist when standing erect. S<lUare holc m the face « Called the hardy hole and is used for holding the hardy and other tools, such as swages and fullers. Mounting the Anvil.—The anvil should be mounted on a solid block, preferably of wood. It should be so located in front of the forge that the workman can take the irons from the fire and place them on the anvil by making a short turn and without the necessity of taking even a full step. The horn should be to the workman's left (unless he is left-handed, in which case it should be to his right). The face of the anvil should be at such a height that it can be touched with the knuckles of the clenched fist when standing erect and swinging the arm straight down. B. Hollow-bit curved-lip tongs. This style is very good for the farm shop. Flat burs na Well as round rod« and bolts can be held in them. hold links practically as well as regular link tongs (see Fig. 245). Tongs 18 to 20 in. long are a good size for average work. 279. Hammers.—A blacksmith's hand hammer weighing 1><£ or 2 lb. and another weighing 3 or VA lb. will handle all ordinary work very satisfactorily. 280. Hardy, Chisels, Punches.—There should be a hardy to fit the hole in the anvil, and there should be a fair assortment of hand cold chisels and punches. The chisels and punches may be made in the shop. If considerable blacksmithing is to be done, it would be well to have a hot cutter and a cold cutter (simply large chisels with handles on them) for heavy cutting with a sledge hammer. It would be well, also to have one or two large punches with handles on them for punching holes in hot metal. Punches for making holes % in. and H hi. in diameter are probably most useful. 281. Vise.—One vise can well serve for all metal work in the farm shop, including blacksmithing if it is heavy and strong enough. A heavy blacksmith's steel-leg vise with jaws 4 to 5 in. wide is generally preferred as an all-purpose vise in the farm shop. 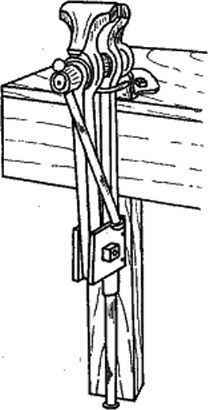 A leg vise Is one that has one leg extending down to be anchored or fastened into the floor. Such a vise can be used for heavy hammering and bending better than other types. Fig. 240.—A heavy blacksmith's steel-leg vise is a good type of vise for the farm shop. If there is a strong steel machinist's box vise in the shop, it can be used for blacksmithing work if care is used not to do too heavy hammering or bending with it. Fig. 247.—Homemade forge fire tools. A, shovel; B, poker. piece of heavy sheet iron about 3 or 4 in. wide by 4 or 5 in. long, riveted to a bar or rod for a handle, makes a good shovel. A 3^-in. round rod, with an oblong eye in one end to serve as a handle and the other end flattened and curved, makes a good combination poker and rake. 283. Measuring Tools.—Some kind of metal rule will be needed for measuring and checking pieces being forged. A small steel square is very good for both measuring lengths and checking angles and bends. A wooden rule should not be used to measure hot iron. A caliper, or a caliper rule, for measuring diameter of rods and thickness of parts, although not a necessity, will be found very convenient. A. The small steel square is very useful for checking bends and angles as well as for meaeuring. R. The caliper rule is especially good for measuring the diameter or thickness of bolts, rods, and bars; ¡w well »« for general measuring. A good fire is the first requirement for good blacksmithing. Many beginners do poor work simply because they do not recognize the importance of a good fire. 284. Fuel for the Forge Fire.—Blacksmithing coal is used in the forge. It is a high-quality soft coal that is practically free from sulphur, phosphorus, and other objectionable impurities. When dampened and packed down around the fire, it readily cakes and changes to coke, which is a lightweight material that burns with a clean, intense flame. Ordinary stove or furnace coal will not work satisfactorily in a forge. 285. Building the Fire.—To start a fire, first clean the fire bowl with the hands, pushing all coal and coke back on the hearth and throwing out-all clinkers. Clinkers are heavy and metallic and have sharp, hard corners or projections and are therefore easily distinguished from the coke, which is light in weight, and easily crumbled. Fine cinders and ashes are easily shaken through the grate into the ashpit.